Britain will benefit from Romanian and Bulgarian membership of the EU, Foreign Secretary Margaret Beckett said, as the countries celebrated their accession. 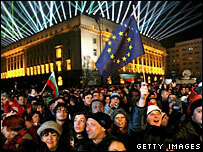 Bulgarians and Romanians coming to work in the UK will face extra restrictions compared with other EU citizens. Predictions on how many will come to Britain vary from 56,000 to 180,000 in the first year. Mrs Beckett acknowledged the UK would have to work with the new member states on the question of organised crime. The EU now has 27 members - up from 15 three years ago - and a population of 500 million. The Conservatives said allowing any EU citizen to work in the UK if they were self-employed was a "big loophole". Shadow home secretary David Davis said the measures were "open to abuse" and dismissed the government's talk of a managed flow of workers as "a piece of spin". The new system will be reviewed within 12 months, said the Home Office. Mrs Beckett said: "In the last few years economic growth in both countries has been rapid and UK trade has boomed alongside it. "These two countries will bring their own particular contributions to the EU." Britain looked forward to working closely with Bulgaria and Romania on such challenges as climate change, organised crime and terrorism, she said. "These are bigger than any individual state. But working together through an enlarged EU we can solve them," said Mrs Beckett. Anti-mass migration group Migrationwatch has admitted its 180,000 prediction - which it says is based on government suggestions of a link between the poverty of the sending country and the numbers who arrive - is "very unlikely". "But it serves to illustrate the degree of uncertainty," said chairman Sir Andrew Green. Left-wing think-tank the Institute for Public Policy Research put the figure at 56,000. Keith Best, chief executive of charity the Immigration Advisory Service, said the impact of Bulgaria and Romania joining would be nothing compared to the eight countries that joined in 2004. "The combined population of both countries is less than Poland, just one of the previous tranche. "I am also satisfied that the traditional migration pattern for these two countries is to the Mediterranean countries, not to the north." He said most who wanted to come here would already have done so. Romania's acting ambassador in the UK, Raduta Matache, has said she expected most of her countrymen looking for work abroad to head for Italy or Spain. The Home Office had earlier revealed its plans to limit the right to work for Bulgarians and Romanians. Unskilled workers will initially be limited to quota-based schemes that fill vacancies in the agricultural and food processing sectors. The skilled can work if they get a permit, are a student, or are self-employed. They could also come to the UK if they qualify under the Highly Skilled Migrant Programme - which currently allows under 100 per year. On-the-spot fines of £1,000 and penalties for employers of up to £5,000 are in place to penalise law-breaking, said the government. The new curbs contrast with the "open-door" policy adopted in 2004, when 15,000 migrant workers were expected to arrive each year. Instead 600,000 arrived in two years.